You may directly link current and historical market values of drawing tools, technical indicators and bar data from X_STUDY to MD Trader, the Market Window, and Autotrader. Once linked, the trading window updates in real-time as new prices are generated in X_STUDY. A new technology is utilized that outperforms Microsoft Excel (RTD) linking. Using these links and avoiding Excel also increases PC performance by reducing the number of applications running on your desktop. Right-click the drawing tool, technical indicator or bar that you want to link to the trading window. Select Link to X_TRADER| Current Value. Select any additional parameters (e.g., MBAND). Open the trading window and navigate to where you want to paste the data. Right-click the window and select Links | Paste Link. 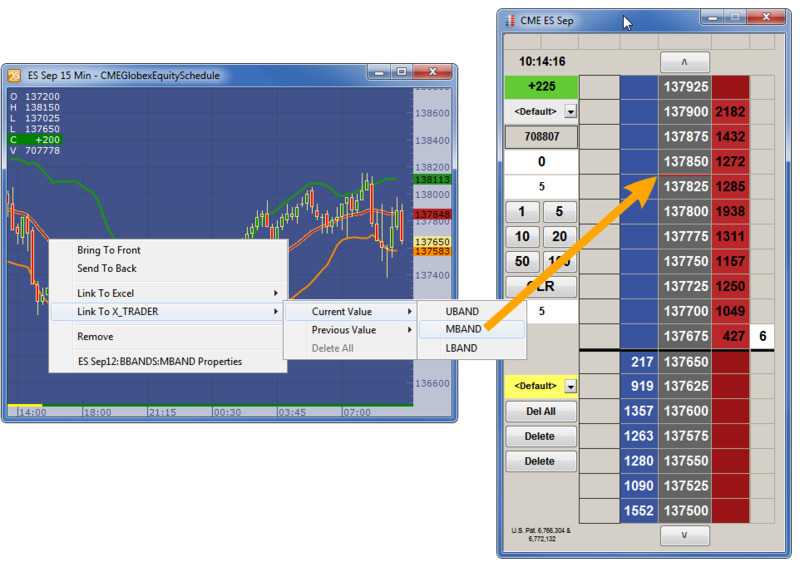 Select Link to X_TRADER | Previous Value. Type the Number of Bars Back to Link and click OK.